The Clog: Where did the idea for the project come from? JW: We developed the idea as part of the tenth anniversary celebration for Caltopia 2012. Our goal was to develop a project that could be launched at the event and continue to connect and inspire the Cal community throughout the year. The Berkeley Journal Project is based in concept on a number of similar efforts including the 1001 Journal Project that was launched a few years ago in SF. Our goal is to follow 1,868 journals as the travel around the UC Berkeley campus and Cal community around the country throughout the academic year. Beginning as blank pages, participants are encouraged to express their stories, drawings and personal reflections before passing each journal on to friends, colleagues, or even to strangers. The Clog: Is your affiliation with Cal Rec Sports intentional? JW: Cal Rec Sports has a mission of service to the UC Berkeley campus and community. We see The Berkeley Journal Project as an opportunity to enhance the student experience and connect the Cal community. 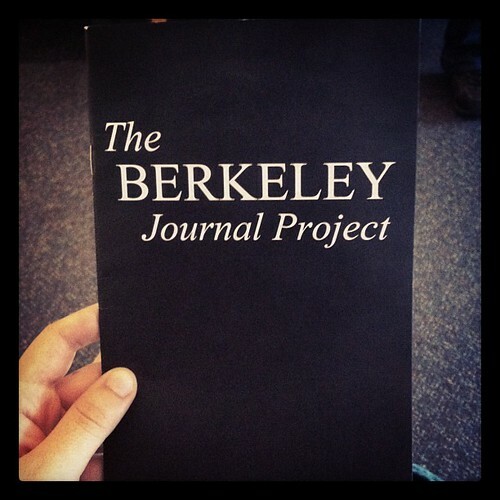 The Berkeley Journal Project was developed Cal Rec Sports. We are partnering with other campus organizations and student groups including the Cal Alumni Association to help promote the project. The Clog: What do you hope that the Berkeley community will get out of the project? JW: Our goal is to connect the Cal community through self-expression, creativity and imagination. The Clog: How will you choose which journal pages are included in the presentation and what will this presentation entail? JW: Our internal group of Cal Rec Sports staff and student leaders will chose pages from selected journals. The multi-media exhibit will be delivered through an integrated social media, web based and experiential platform.